There is a moment early in "Apollo 13" when astronaut Jim Lovell is taking some press on a tour of the Kennedy Space Center, and he brags that they have a computer "that fits in one room and can send out millions of instructions." And I'm thinking to myself, hell, I'm writing this review on a better computer than the one that got us to the moon. "Apollo 13" inspires many reflections, and one of them is that America's space program was achieved with equipment that would look like tin cans today. Like Lindbergh, who crossed the Atlantic in the first plane he could string together that might make it, we went to the moon the moment we could, with the tools that were at hand. Today, with new alloys, engines, fuels, computers and technology, it would be safer and cheaper - but we have lost the will. "Apollo 13" never really states its theme, except perhaps in one sentence of narration at the end, but the whole film is suffused with it: The space program was a really extraordinary thing, something to be proud of, and those who went into space were not just "heroes," which is a cliché, but brave and resourceful. Those qualities were never demonstrated more dramatically than in the flight of the 13th Apollo mission in April 1970, when an oxygen tank exploded en route to the moon. The three astronauts on board - Jim Lovell, Fred Haise and Jack Swigert - were faced with the possibility of becoming marooned in space. Their oxygen could run out, they could be poisoned by carbon dioxide accumulations, or they could freeze to death. If somehow they were able to return to the Earth's atmosphere, they had to enter at precisely the right angle. Too steep an entry, and they would be incinerated; too shallow, and they would skip off the top of the atmosphere like a stone on a pond, and fly off forever into space. Ron Howard's film of this mission is directed with a single-mindedness and attention to detail that makes it riveting. He doesn't make the mistake of adding cornball little subplots to popularize the material; he knows he has a great story, and he tells it in a docudrama that feels like it was filmed on location in outer space. So convincing are the details, indeed, that I went back to look at "For All Mankind," the great 1989 documentary directed by ex-astronaut Al Reinert, who co-wrote "Apollo 13." It was an uncanny experience, like looking at the origins of the current picture. Countless details were exactly the same: the astronauts boarding the spacecraft, the lift-off, the inside of the cabin, the view from space, the chilling sight of their oxygen supply venting into space, even the little tape recorder floating in free-fall, playing country music. All these images are from the documentary, all look almost exactly the same in the movie, and that is why Howard has been at pains to emphasize that every shot in "Apollo 13" is new. No documentary footage was used. The special effects - models, animation, shots where the actors were made weightless by floating inside a descending airplane - have re-created the experience exactly. The astronauts are played by Tom Hanks (Lovell), Bill Paxton (Haise) and Kevin Bacon (Swigert). The pilot originally scheduled for the Apollo 13 mission was Ken Mattingly (Gary Sinise), who was grounded because he had been exposed to the measles. The key figure at Houston Mission Control is Gene Kranz (Ed Harris). Clean-cut, crew-cut, wearing white collars even in space, the astronauts had been built up in the public mind as supermen, but as Tom Wolfe's book and Phil Kaufman's movie "The Right Stuff" revealed, they were more likely to be hot-shot test pilots (with the exception of John Glenn) than straight arrows. 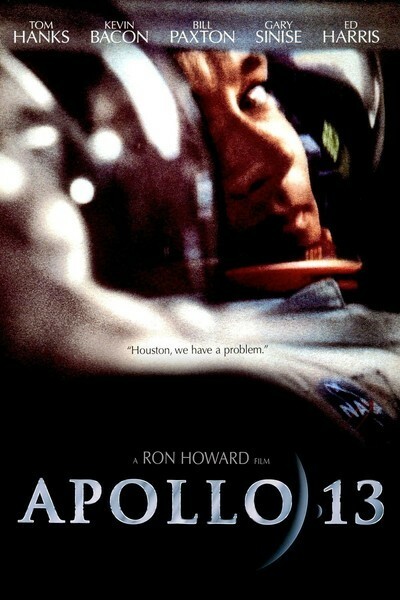 The movie begins with the surprise selection of Lovell's group to crew Apollo 13. We meet members of their families, particularly Marilyn Lovell (Kathleen Quinlan), we follow some of the training, and then the movie follows the ill-fated mission, in space and on the ground. Kranz, the Harris character, chain-smoking Camels, masterminds the ground effort to figure out how (and if) Apollo 13 can ever return. A scheme is dreamed up to shut down power in the space capsule and move the astronauts into the lunar exploratory module, as a sort of temporary lifeboat. The lunar lander will be jettisoned at the last minute, and the main capsule's weakened batteries may have enough power left to allow the crew to return alive. Meanwhile, the problem is to keep them from dying in space. A scrubber to clean carbon dioxide from the capsule's air supply is jerry-built out of materials on board (and you can see a guy holding one just like it in "For All Mankind"). And you begin to realize, as the astronauts swing around the dark side of the moon and head for home, that, given the enormity of the task of returning to Earth, their craft and equipment is only a little more adequate than the rocket sled in which Evil Knievel proposed to hurtle across Snake River Canyon at about the same time. Ron Howard has become a director who specializes in stories involving large groups of characters: "Cocoon," "Parenthood," "Backdraft," "The Paper." Those were all films that paid attention to the individual human stories involved; they were a triumph of construction, indeed, in keeping many stories afloat and interesting. With "Apollo 13," he correctly decides that the story is in the mission. There is a useful counterpoint in the scenes involving Lovell's wife, waiting fearfully on the ground. (She tells their son, "Something broke on your daddy's spaceship, and he's going to have to turn around before he even gets to the moon.") But Howard adds no additional side stories, no little parallel dramas, as a lesser director might have. This is a powerful story, one of the year's best films, told with great clarity and remarkable technical detail, and acted without pumped-up histrionics. It's about men trained to do a job, and doing a better one than anyone could have imagined. The buried message is: When we dialed down the space program, we lost something crucial to our vision. When I was a kid, they used to predict that by the year 2000, you'd be able to go to the moon. Nobody ever thought to predict that you'd be able to, but nobody would bother.